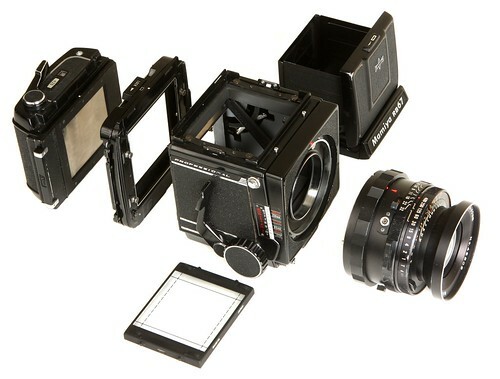 The RB67 is a professional medium format SLR camera by Mamiya. Kamera no ayumi. Zen nihon shashin renmei sōritsu 50-shūnen kinen (カメラのあゆみ・全日本写真連盟創立五〇周年記念, History of cameras, commemorating the 50th anniversary of the All Japan Association of Photographic Societies). Tokyo: Asahi Shinbunsha, 1976. No ISBN number. P.107. Lewis, Gordon, ed. The History of the Japanese Camera. Rochester, N.Y.: George Eastman House, International Museum of Photography & Film, 1991. ISBN 0-935398-17-1 (paper), ISBN 0-935398-16-3 (hard). Pp.133 and 169. McKeown, James M. and Joan C. McKeown's Price Guide to Antique and Classic Cameras, 12th Edition, 2005-2006. USA, Centennial Photo Service, 2004. ISBN 0-931838-40-1 (hardcover). ISBN 0-931838-41-X (softcover). P.648. Sugiyama, Kōichi (杉山浩一); Naoi, Hiroaki (直井浩明); Bullock, John R. The Collector's Guide to Japanese Cameras. 国産カメラ図鑑 (Kokusan kamera zukan). Tokyo: Asahi Sonorama, 1985. ISBN 4-257-03187-5. Item 2171.